All of us want to be happy, but all of us are influenced by negativity from all directions, be it from the outside or from within us. Negative criticism from people we know, or own own negative habits, or even the negative voices in our head--all of them steal our joy, self confidence and happiness. In order to be truly happy, we need to learn how to ignore and disregard all such negativity in our life. There are three sources of most negativity in our lives - negativity from our relationships, negativity from our environment, and negativity from within us. Here's how we can deal with them so that they don't affect our happiness. Have you ever noticed how conversations with some people leave us feeling totally drained and bad about ourselves and our life? We must make it a point to spend as little time as possible with them. And whatever time we do spend with them, we must make a habit of disregarding all the negative words they throw at us, so that their negativity doesn't get to us. We must set clear boundaries in our relationships. At the same time, we need to surround ourselves with more positive and upbeat people. Their passion, enthusiasm and energy will keep us mentally and emotionally charged. Once upon a time, more than 15 years ago, there used to be just one TV channel, and news was telecast once every morning and night. Now, we have innumerable dedicated news channels, bombarding us with negativity 24 by 7. On top of that, we also have the self-proclaimed jury on social media, ready to give their verdict (mostly negative) on everything under the sun. We need to limit such toxic media. Instead, we must spend more time doing stuff that makes us feel good and helps us appreciate our life. We can cut the negative media from our lives and avoid the negative people, but what about that voice inside our head? Our inner critic? The one whose favorite pastime is to regret our past choices and worry about our future. The one who keeps telling us all the time that we are not good enough. How do we distance ourselves from that voice? Is there a way we can throw it out of our head? No, there isn't. But we can practice to ignore that voice and make it shut up for at least some time during the day. We can do more of things that we know we're good at. I've found that learning new things, taking up new challenges, always works for me. We need to develop the habit of focusing on our DREAMS instead of our fears. We need to accept ourselves as we are, to shut our inner critic. We must learn to forgive (will be covered under "F"), to let go of the regrets. And we must believe in the best of ourselves and others, to let go of the worry. If we go to a restaurant and happen to order something new that doesn't quite agree with us, we don't feel obliged to eat it anyway, do we? We just leave it. We need to practice the same approach when we are served any kind of negativity in life. Just disregard it. What do you do when you encounter toxic people? How do you deal with them? How much time do you give to the media and social media per day? What techniques do you practice to control the negative thoughts in your mind? This is my fourth post for AtoZ2017. I agree! Negativity is completely draining. Once, I had a friend who constantly bombarded me with a litany of complaints about how awful her life was. Worse yet, it was the same harangue, over and over again, to the point where I could recite it by rote. :P After a couple of years, I just couldn't take it anymore and stopped returning her calls. I agree that you should limit the negative relationships in your life, but what about infusing positivity into those relationships? You aren't responsible for another person's happiness, but sometimes negativity is more of a habit than a set-in-stone state of mind and you can do much to help a friend see that and turn around some of the negativity. Negativity is a huge issue. One of my resolutions for 2016 was to eliminate negative people from my life. So far I've broken bonds with two people and am already feeling much happier. Negativity has the power to drain one out completely and that analogy with restaurant is perfect. We need to make the choice of picking and throwing away the negativity out of our lives. There is no point harping on it. Thanks for this important reminder Chicky! Totally agree, Raji! And life would be so much more peaceful. You did good, Debbie. It's best to let such people go, unless of course you know that they're only going through a temporary low phase. And I agree, we are our worst critics. Yes Tracy, we ought to do that, and I think most of us DO try to help first. But some people are just not ready to move out of their misery. They don't want to make any effort to be happy. I think it's best to detach from them. I did that in 2011, Elizabeth, when I moved to Jaipur to get away from my toxic relatives. And I am so much more peaceful now! Exactly Parul! We need to just filter it out. I often let negativity get the better of me. It's so hard to shake off. I know elenchera! It is really difficult, but we must try anyway. My post for today is about the kind of people your described in the first part of this post. Until now, I used to try my best to compromise to keep it harmonious between me and the toxic people around me. But like you so aptly said about the restaurant food, I soon understood, it's only harming me. So no more kissing dementors for me, so to speak! Oh yes, negativity can drain you. Worst is that it is contagious. If you're constantly around someone who is very negative, then within no time you'd become negative yourself and that affects every sphere of your life. 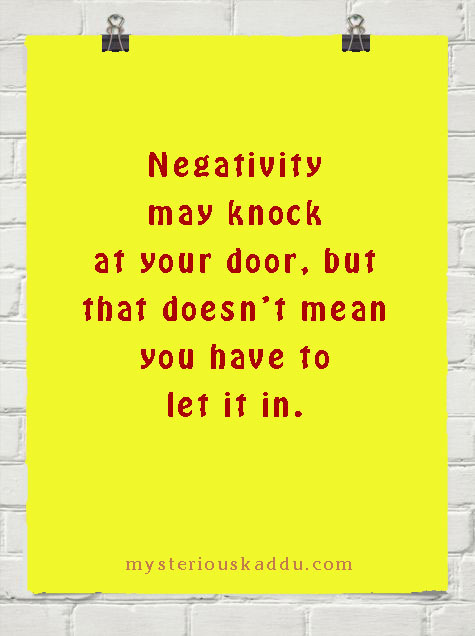 So yes, keep away from any kind of negativity! Negativity from within is the hardest battle to win, isn't it? Once you win that battle, nothing can stop you from being happy! That's our first instinct Sreesha, isn't it? To compromise. To make peace. To suffer in silence. But it really does get very toxic after a while. I speak from experience. Rightly said, Shilpa. We were actually taught in my Reiki 2 class, to select our social circle very carefully. Thank you, Jaish. I personally find the last one most challenging. Shutting up my own self critic. Exactly, Swathi. That is my biggest challenge! High time we let go off such toxic people from our lives! Great post! Hi! here from the A-Z and enjoyed reading your post. Very topical. With age/experience, that voice of the inner critic tones down the volume a bit. Very well written posts and yes true about the dementors!!! Hi five to another potterhead!! I have completely stopped watching the news, getting the newspaper and even getting into politics on twitter - man its just too draining. Negativity takes a toll on me! Big time! If for once, the chain of thoughts start, they decide to never leave! And then I go in the self-pity mode! I need to work on that part of me a lot! Negativity & negative people need to be managed for our well-being. As difficult as it may seem, disregarding the negativity is what helps to be strong. Great post! You know Chicky, strangely the most difficult negativity to overcome is the one from ourselves. External is sometimes easier to battle with than the war that wages within (did i just do a w?) But what a challenge it is to deal with negativity. I see it as a web that sticks to us and even when we make a dent, parts of it stick. As for people, I've learned the hard way to focus on those who love me. Love the quote. It pretty much summed up your post for me. Good advice. There is a conscious effort required to remove all the negativity you have mentioned from our lives. negativity can bring about more stress in our lives . This it is important we all put in the effort as much as possible and stay positive more. I noticed this previously too, but the dates of these posts are from previous year's. Are you posting last year's posts this time? I agree, there's too much information for us these days on media channels and sometimes it all gets quite overwhelming. I make it a point to surround myself with positive people to cut out stress from my life. I have often found that when we are thankful for what have, we tend to feel less negative towards our environment, people around us etc. a little hard to escape the truth of this post... personally, I am in a negative space and this kind of ticks most of the boxes of whats wrong. Aptly said, Duncan. Some doors really need to stay shut. I have even forbidden my Dad to put on those TV debates during meal times, when we watch TV together! Oh I know what you mean, Geets! It happens with me too! But I'm getting better at distracting my mind gradually. I start doing something else whenever my thoughts spiral downwards. True, Smiled. Thank you for stopping by! You're right, Vidya. That's the negativity that hinders us the most. We can get over the other external influences easily enough, but our own inner critic causes us to sabotage ourselves... repeatedly! Thanks Suzy! Yes, I'm trying to select quotes that convey what I have in mind for the topic. Happy blogging! Oh it totally stresses us out, Ramya. As if we don't already have enough on our plates! You're right, Radhika! We automatically feel inspired in the company of highly motivated people, don't we? Vinodini, I started this series last year, but could only reach to E. I injured my shoulder and had to undergo long physiotherapy sessions multiple times a day. I decided I'll complete it this year. Hey, you commented twice, Dipanwita? 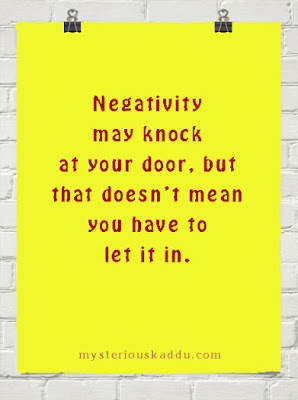 Negativity plays such a big part in holding us back! Fighting negativity from within is the most difficult part, once that is done, everything else falls into place.wonderful thoughts. I like the idea of disregarding negativity like not eating a dish you don't like. Unfortunately my mother taught me to eat everything. Maybe I'll stop eating things I don't like first and then I'll be able to avoid negativity. At present, the negativity in me is from within. Your next post is gonna throw light on that. Sometimes, you know it all, but it's difficult to implement. That's how most of us are brought up, Kalpanaa. And that's precisely why most of us remain unhappy through most of our life. True Anmol... it is difficult to implement so often. I guess practice makes us better. Doesn't that feel so liberating, Sanch?